Enhanced Support for Saving Attachments - The BlackBerry Bridge app offers you more flexibility around where and how you save attachments for viewing and editing. You can now save an attachment to a removable SD card, or to your BlackBerry smartphone's internal flash memory. ZIP Attachment Support - The BlackBerry Bridge app now gives you access to ZIP files received as an email attachment. While bridged, you can now download a zip file from an email to your smartphone SD card and then extract compressed contents for viewing or editing on your BlackBerry PlayBook tablet. Portrait Support in Pictures App - With BlackBerry Tablet OS v1.0.7, pictures that you've taken with your BlackBerry PlayBook tablet or transferred from your PC can now be viewed in either portrait or landscape formats for the layout that best fits your needs. Pinch to Zoom in Video App - Use the pinch gesture to zoom in on the finer details of your favorite video content, just like you would with a website or picture today - all while the video continues to play. With BlackBerry Tablet OS v1.0.7, RIM added additional support for the following 15 languages: Basque, Catalan, Czech, Danish, Galician, Hungarian, Bahasa Indonesia, Norwegian, Polish, Portuguese Brazilian, Portuguese European, Swedish, Turkish, Romanian and Russian. To download, just fire up your PlayBook and Check for Updates from settings (damn I love how easy it is to do over the air updates on the PlayBook). 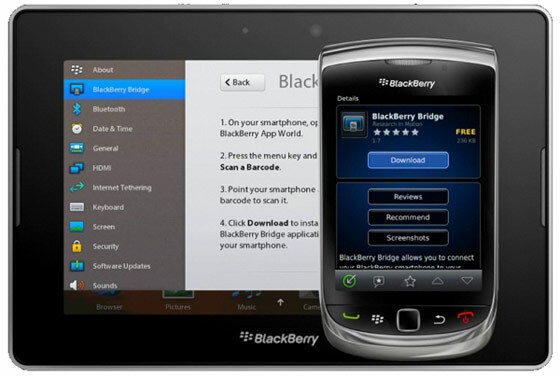 Don't forget to update BlackBerry Bridge on your BlackBerry Smartphone to the latest version too.